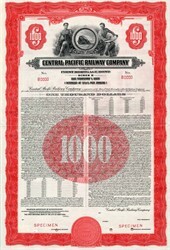 Beautiful specimen certificate from the Central Pacific Railway Company Company printed in 1948. This historic document was printed by the Columbian Bank Note Company and has an ornate border around it with a vignette of allegorical figures. 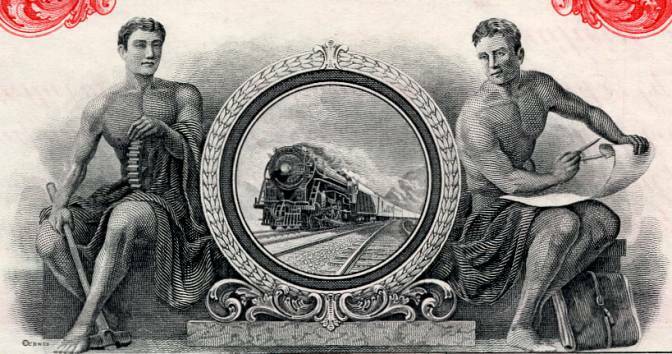 The Central Pacific Railroad (CPRR) is the former name of the railroad network built between California and Utah, USA that formed part of the "First Transcontinental Railroad" in North America. It is now part of the Union Pacific Railroad. Many 19th century national proposals to build a transcontinental railroad failed because of the energy consumed by political disputes over slavery. With the secession of the South, the modernizers in the Republican Party controlled the US Congress. They passed legislation to authorize the railroad, and created financing in the form of government railroad bonds. These were all eventually repaid with interest. The government and the railroads both shared in the increased value of the land grants, which the railroads developed. The construction of the railroad also secured for the government the economical "safe and speedy transportation of the mails, troops, munitions of war, and public stores." Planned by Theodore Judah, the Central Pacific Railroad was authorized by Congress in 1862. It was financed and built through "The Big Four" (who called themselves "The Associates"): Sacramento, California businessmen Leland Stanford, Collis Huntington, Charles Crocker, and Mark Hopkins. Crocker was in charge of construction. The western labor teams were primarily made up of Chinese emigrant workers with up to 12,000 such laborers employed by the Central Pacific Railroad representing 90 percent of the entire work force. They laid the first rails in 1863. The "Golden spike", connecting the western railroad to the Union Pacific Railroad at Promontory, Utah, was hammered on May 10, 1869. Coast-to-coast train travel in eight days became possible, replacing months-long sea voyages and lengthy, hazardous travel by wagon trains. In 1885 the Central Pacific Railroad was leased by the Southern Pacific Company. Technically the CPRR remained a corporate entity until 1959, when it was formally merged into Southern Pacific. (It was reorganized in 1899 as the Central Pacific "Railway".) The original right-of-way is now controlled by the Union Pacific, which purchased Southern Pacific in 1996.